Yearly average airline fare since 1995. When taking the average price of domestic airline fares, there is a clear trend indicating that flying is becoming more affordable - when adjusted for inflation. This may seem impossible when you look at the current price of your ticket and see that it is higher than last year. That's because the last two years have seen an increase, but the overall trend is still downward. How can the airlines sustain this downward price trend with the cost of fuel going up? In an earlier article, it was shown that gas isn't as expensive as it appears - again, when adjusted for inflation. That being said, gas prices have increased in the last couple of years, which may explain the air fare prices going up in the same period. If you add the average baggage fee to the average airline fee, then the total cost to fly only goes up by less than $5 in all cases. Thus, the downward trend in ticket prices would still continue. Whether or not this has anything to do with reduced fares is open for speculation and warrants an investigation in its own right. That being said, the upward trend of ticket prices in the last 2 years corresponds with the drop in carriers during that same time. This will be something to monitor as time progresses. Another point to consider is the cost of meals and drinks on airlines. In the past these were complimentary, but now a passenger must pay for anything beyond the typical "bag of peanuts." Undoubtedly this has saved airlines millions of dollars and thus enabled them to keep their prices competitive. One can only hope that the fares remain stable so that we can all afford to fly for the foreseeable future. 1) Will more fuel-efficient planes help to reduce ticket prices? 2) What are the barriers for low-cost airlines to enter the market? 3) Is there an alternative fuel solution for large planes? This particular article speaks on fuel efficiency but does not talk about the effects of reducing ticket prices.. Good read all the same. Zero emissions in 50 years? Would love to see that! For question 2 here is a entry market report from 1996 from the Government General Accounting office. It will be interesting to see how it will compare to a report from 2011. This report was done in 2011 by 2 college students. They talk about the governmental requirements and mandates. 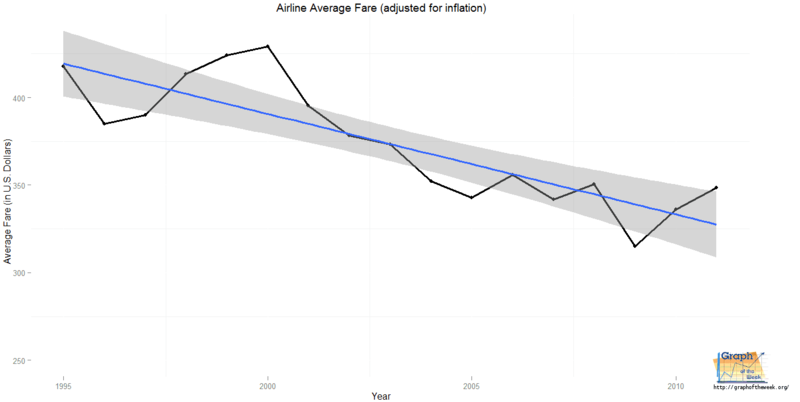 Also, how the half of the decline in fares is driven by the entry of low-cost carriers into new markets. These types of reports aren't very accessible for most people. That is why I created this site. That being said, I agree that airports with only a few carriers increase prices - I've been victim to this many times. It doesn't surprise me that low-cost carriers keep fares down. Competition is a good thing, no matter what the market. Several of the major carriers are in the midst of testing biofuels. The US Military has also jumped on the bandwagon with the testing of 40 aircraft with biofuels blends by the year 2013.
http://www.biofuelstp.eu/air.html This is a great article about the different airlines that are actually testing and using biofuels. These are great articles, accessible by the general public - always thankful to see these.